For those of you who are working hard through this first week of my 30-day November to Remember Challenge 2014, good for you! For those of you who are not working hard through this first week of my 30-day November to Remember Challenge 2014, there is still time! For those of you who read my challenge and started thinking about doing the scaled-down version of the Parkinson’s Recipe for Recovery® instead of actually doing it, are you aware that an entire week has passed you by? What are you waiting for? Make this your November to Remember and start your recovery from Parkinson’s! “I was on a coaching call a couple of days ago and was questioned about how Qigong works, basically, what is it really doing because sometimes it is hard to know if it is doing anything at all. After a deep discussion about Qigong in general, followed by a discussion of Qigong in the Recipe for Recovery, it made sense to the person, and she suggested I write about because she felt it would be meaningful for all of you. Ultimately, it comes down to faith, attitude, and action to make progress…I will begin, as I did with her on Wednesday, and start with action. Action. In my Recipe for Recovery, there are Qigong exercises that require us to take action to fight our Parkinson’s. These are not general Qigong exercises that one would learn taking an introductory Qigong class. These are medical Qigong exercises designed to heal the liver and kidneys and help them function better. Since I view one of the causes of Parkinson’s as: “Kidney and Liver Wind Deficiency, which is caused by overwork and insufficient rest which unbalances the body’s natural rhythm,” I researched medical Qigong to focus my initial action to rectify these deficiencies. Qigong in general. Our hearts pump our blood through our bodies. Our lymph system needs our assistance to move it throughout our bodies to build up immunity and cleanse toxins. Enter Qigong. Qigong is known as a soft exercise in that it does not require a whole lot of physical exertion, but it still still builds up internal energy because we are moving our bodies slowly and stimulating our lymph system. Medical Qigong for Liver and Kidneys in the Recipe for Recovery. The slow Qigong movements are focused on these specific organs. However, there are additional benefits. The liver is paired with the gallbladder as an organ system. The kidneys are paired with the bladder as an organ system. And, the lungs (it is not possible to do these Qigong exercises without breathing in a whole lot more oxygen than just sitting around) are paired with the large intestine as an organ system. So, by doing these Qigong exercises, we are working on healing our liver, gallbladder, kidneys, bladder, lungs and large intestine. It is why many people have reported back to me that within days of beginning the Recipe for Recovery, they notice an increase in energy, their bowel movements have become regular and easy, their sense of smell has returned, that although they still feel pain their shoulders and knees are looser, they can turn their head and look back when backing up their car…these are small signs of progress, but they are signs of progress nonetheless. Now, envision the mountain of ice below the surface that sunk the Titanic. Further, envision that you are placed deep into the center of this mountain of ice and you have a tiny hammer and chisel. Your goal is that each day you will chip away at the ice in a symmetrical manner. To an onlooker at the surface, they cannot even see you are in there chipping away. To an onlooker at the surface, the iceberg looks just as solid as it did the very first time they saw it. There it is in a nutshell (or iceberg), how the Recipe for Recovery works. After nine months of doing the recipe and seeing very little improvement of my symptoms, I started seeing a lot of improvement and two weeks later I had no symptoms. The causes were removed and the disease went away. This is also known as full recovery. The Qigong in the Recipe amounts to us taking action. The Qigong in the Recipe amounts to us chipping away at the iceberg from the inside out. To an onlooker, we look like we are accomplishing nothing, that we are crazy and wasting our time. Yes, our symptoms are an annoyance and an inconvenience, but I was not focused on relieving my symptoms. 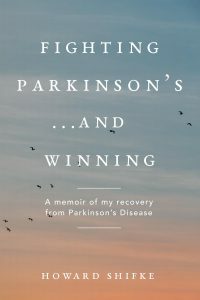 Instead, I was focused on ridding myself of Parkinson’s, and then the symptoms would go away. Actually experiencing the symptoms is what gave me the insight to understand what needed to be accomplished to beat this disease. I saw the enemy, I was able to endure what it had to deliver, I learned what I needed to learn to defeat it, and I took action. Every day we do something to defeat this disease we are making progress. Faith. At the beginning, we have to have faith in our own recovery and faith in the process we are using to lead us down the path to recovery. Attitude. We have to keep a good attitude that no matter how we feel, we are making progress because we have faith that we are on the correct path. Action. I have said many times that faith without action is meaningless for Parkinson’s recovery. Action proves faith! Action says, “I so firmly believe that I will recover that I am willing to do Qigong exercises every day even if I cannot actually feel them healing me from deep within and even if I do not get immediate relief of my symptoms.” Some people think this kind of faith is crazy. I feel that this kind of faith leads to recovery. Did you ever stop to think that the same people who call this kind of faith crazy actually have no faith at all in recovery — they still feel that one cannot recover from Parkinson’s. We are proving them wrong. Progress. Every day you wake up in the morning you are making progress in the path of life. Every day you do something in furtherance of fighting your Parkinson’s you are making progress on the path of Parkinson’s recovery. With strong faith, a great attitude, and proper action, you come to the realization that every day you employ this formula, you are making progress. And, one day you may wake up making progress in the path of life and realize that you have successfully completed the path of Parkinson’s recovery. It will be overwhelming. So, what are you doing in the moment, NOW? Why not grab onto some strong faith and a great attitude, and start taking some proper action, NOW! Aren’t you worth it?” Yes, you are worth it! Don’t you want to finish your Parkinson’s journey before you finish your life’s journey? I thought so! So, here’s what you need to do: Accept my 30-day challenge and make this your November to Remember for your Parkinson’s recovery!!! Howard, and my Recovery Community, today is, as we all know, the first day of the rest of our lives!! Choose to live it!! With Howard’s powerful message firmly locked in my mind, I set out on my daily adventure (of Life), KNOWING that slowly & surely, day by day, I am healing myself. Every time I have a “wobble”, it seems, Howard is there with a new blog post – a new shot of positivity, another reason to keep fighting on, to keep recovering!! What an amazing, humbling, and at the same time incredibly empowering journey this is for us all. What an amazing mentor we have. Howard, thank you always! I love the iceberg analogy. This post was exactly what I needed when I thought I didn’t need anything! A great shot in the arm! Thank-you for being there, Howard. What hope would we have if you were not out there always dangling that carrot? And, it’s real hope, not some pipe dream! Sometimes I wake in the morning thinking I’m too tired to fight one more day: then here you come with all this sunshine! Can’t thank you enough, Howard. I thank God for you daily. Your words are just the encouragement I needed today. Thank you again. Thanks Howard and everyone who has been sharing their journey with me! I will keep moving forward with this POWERFUL November Challenge. I have a smile on my face and gratefulness in my heart. ( I love the gratitude list that Howard challenged us to do.) I have the power to change and to take control of my thoughts and actions. Hi Howard and all our gang, great to hear everyone doing great. I have not missed a day which is massive for me. 😉 . I want to ask you all, am I the only one who seems to nearly come to a standstill with The Recipe? I totally know I am generating new internal electrical impulses which zap my muscles more as they clear blockages, but I do find it so challenging when I can barely take a step forward. I know I am doing GREAT 😉 but nobody else seems to mention seizing so much so quickly. So I thought I would mention it and see if anyone else has similar struggle? Love to you all and big gratitude to our coach. Howard the iceberg is one of my favourite of your analogies. Keep shining my friend. Congratulations on doing the Recipe every day!! I don’t know as that we have the same challenges, or are in the same stage of healing, but I have faith that the Recipe Works no matter where we are at along this road. I would imagine that we all face different trials both physically and emotionally and definitely some days are easier than others; but I totally judge how I am doing by how well I am following the Recipe. There may be things that I can not change or that I have no control over, but I can always be working on my faith, attitude and efforts( or action) by doing the recipe…..So it sounds to me like you are doing GREAT !!!!! Remember that our best is always good enough. I am writing this note as a reminder for me hoping that it may help as a reminder to you . I enjoy reading your comments as they help me stay on track and know that I am not alone. Thank you. Once Again..Congratulations on your efforts !!! Howard, I accept your challenge! Fortunately, I have the “willfulness” to be faithful to the exercises even before your challenge as I am confident in recovering. Blessings to all, it does work, don’t give up no matter how you feel!! Some days are harder than others, but keep forging ahead! Love to all! Howard’s words make me moved and cry. It’s so comforting to read his blog. It’s so true that many poeple think : “Hey, there is a person in the middle of that iceberg with a small hammer and chisel chipping away.” The onlooker shakes their head and tells the person, “If that is so, they are crazy and they are wasting their time”. I feel, all, except my supportive family & siblings, think like that and try talking me into taking medication, and I am frightened of the effect of it and don’t want to take it. At the moment I haven’t seen big progress in recovery, but I have faith in Howard and the recipe, they help me keep going doing it no matter what the medical people say. Every time I read his blog, I feel better and have faith again. Thank you very much Howard for your energy, time and kindness put into this to write us your blogs and guide us the way. It’s very precious. not a day go by without me exercising due to exercising makes me feel and look less than an idiot so the discipline is established. Thanks for the motivating reminder to accept the 30 day challenge. Yes you are so right, because I am doing The Recipe daily, that should be my measure of how well I am doing NOT my lack of movement. Like you Debbie, I enjoy reading everyone’s comments. You get to know a little about each other which connects us all. I smiled at Etheline’s comment on doing the exercises to make her feel and look ” less than an idiot” bless you Etheline, we have all felt and feel that way on the bad days. I think when we master that we don’t care or become affected by other peoples reactions to our struggle, we are half way there. Howard said once when you hold your head up and smile people respect you, they only pity you when you hang your head and look like you are not ok. You are far from being an idiot as you are intelligently participating in your own recovery. ;-). With love and gratitude to Howard for his guidance and for creating this circle of Kindredship. Thanks Karen for sharing your experience of refusing to take meds too. I feel better now. It is delightful to see the love and support you have for each other. Your comments on how you are doing, and your comments in response to each other show that yes, we have the power to change the world, one slow Parkinson’s step at a time. In Karen’s original comment above, she mentions about the stiffness or freezing that can set in when moving. I had terrible rigidity as well. I realized that if I pushed my movement to the outer bounds of what the Parkinson’s would allow, it pushed me back hard with stiffness that would stop me in my tracks. As a result, I adopted a “less is more” philosophy of Parkinson’s movement. The less I pushed the limits of my physical capabilities, the more energy I had and the better movement I had. I practiced walking/shuffling by beginning with very small steps. I gradually would move my stride longer and kept practicing, a little longer stride followed by a little longer stride, until I would feel the “push-back,” the rigidity, start to kick in. Then, I would see how long my stride was and shorten it. I would use my shortened stride when I walked, and I did not have rigidity or freezing occur in my walking after that time. Admittedly, in the beginning, it was a shuffle and my stride was very short. I had to throw away my ego and pride regarding how I looked. It was worth it because I never was afraid that when I began walking/shuffling that I would not get where I was going. Knowing I would not be freezing was very calming…it removed fear of freezing. Wishing all of you a wonderful weekend filled with good feelings and slow, steady, and consistent movement! I must tell you all how much your heartfelt comments mean to me in my journey to curedom. Oftimes, your words of encouragement and commitment bring tears of joy to my heart and eyes. Yes, keeping the faith alive in the midst of the sturm and drang of Parkinson’s recovery can be challenging, but truthfully I see no alternative. I’m currently working at reducing my meds and making great progress and looking forward to the day when I’m completely drug free and can then get the most from my Qi Gong exercises. Two remarkable side benefits from doing the Recipe, is that I’ve embraced the list of affirmations supplied by our dear Howard so that my previous cynicism towards them has turned into a life affirming force. And secondly, I’ve begun a dialog with God that I never knew I had within me. I now feel that God wants me to evolve toward greater and greater happiness, and if he (or she) determined that wading through Parkinson’s is my path to freedom, then who am I to argue with him. To each and every one of you mensches, blessings. Hola amigos de esta comunidad tan hermosa , aunque parezca paradojico tracemos algo en nuestras conciencias y sintamonos afortunados y agradecidos por estos mensajes de nuestro cuerpo llamados “sintomas”. Somos un pequeño ejercito pero muy valiente , dispuestos a encontrar nuestra cura y estamos trabajando en conjunto y sintonizados a esa fuerza universal que nos ama , esa energía que silenciosamente transfigura cada situación , para que podamos aprender algo , transformarnos y crecer y que esta sabiduria de nuestra recuperacion en todos los niveles , en la totalidad de nuestro Ser , pueda ser util para nosotros mismos y para que este ejercito de grandes guerreros que Dios eligio , pueda compartirla con el mundo, asi como amorosamente lo ha hecho Howard. no es esta una mision maravillosa? no es esta una buena razon para agradecer el motivo por el cual fuimos elegidos nosotros?……. aunque el camino parezca sinuoso la claridad y la paz que yacen en el trasfondo de nuestra alma brillaran de nuevo al final. Hello friends of this beautiful community, although it seems paradoxical we draw something on our consciences and let us feel lucky and grateful for the messages of our body called “symptoms”. We are a small army but very brave, willing to find our healing and we are working together and tuned to that universal force that loves us, that energy that quietly transforms every situation, so we can learn something, transform and grow and that the wisdom of our recovery at all levels, in all of our being, to be useful to ourselves and to the army of great warriors that God chose, could share it with the world, as well as Howard has done lovingly. Is not this a wonderful mission? Is not this a good reason to thank why we were elected? ……. though the road looks winding, clarity and peace that lie in the background of our souls shines again at the end. I am brand new to all of this, I’ve just begun the November challenge, I’ve managed every day except two mornings when I was running late for work. It’s great to know there are others who are gradually decreasing their meds also, (my Dr and almost everyone else thinks I’m foolish) but I don’t care, my absolute goal is to get off them completely, however as I live alone, and my right side is affected, driving becomes extremely challenging with no meds at all, and I have to stay independent. I’m happy to report that since starting the Recipe, my daytime sleep attacks have vanished and I have more energy. During the breathing exercises, I have observed my tremors increase markedly, though, is this normal, ? Just a bit disconcerting. I love the gratitude list, and have fun thinking of stuff to be thankful for, at the top of my list is Howard and his Recipe. Also really great to feel like I’m not alone, in this monumental battle to regain my health and Vitality. I know that God is with me in my journey. Again, thank you for your kind words and beautiful comments helping each other on this path to recovery. Rebecca from New Zealand states: “During the breathing exercises, I have observed my tremors increase markedly, though, is this normal, ? Just a bit disconcerting.” I would like to comment. Yes, it is normal and there is nothing to worry about. During some of the exercises, especially Standing and Balance, and Brain Vibration Chanting, tremors will increase. Here is what is occurring: The Parkinson’s brain is low on energy. The tremors represent blockages in the meridians. The exercises in the Recipe increase brain energy. When the increased brain energy flows to the body and hits the blockages, tremors increase. When the blockages become opened, tremors decrease. Here are a couple of posts to read more in-depth about this topic: http://www.fightingparkinsonsdrugfree.com/2012/08/14/fighting-parkinsons-and-more-on-cleaning-the-pool/; http://www.fightingparkinsonsdrugfree.com/2012/05/16/fighting-parkinsons-and-trusting-in-your-recovery/. Dear all beautiful community! It is so supportive to read your all comments. We all have good days and not so good days, but we all will go only forward to Recovery. I am the caregiver, but we all also need the support. We all are very lucky to find on our way to Recovery You , dear Howard. I feel so blessed to have such a wonderful community to share with. Yes we do have lots to be thankful for, Howard especially. What a treasure chest of wisdom this man has to give. Faith was a tough number for me, hope I could manage, but Faith? Whoa!! What is that? Such beautiful comments, so much hope, love and faith here. Thanks to Howard Thanks to each of you.